Before beginning N scale track plans, you must first choose what to design the plan on. The best suggestion currently available to build an N scale layout is to use a hollow Core Door. It stands at 6 feet and inches, which is 30% larger in scale but the great part about this type of benchwork is that it takes up less room. Another great attribute is that the doors come in a variety of widths that give you the flexibility in choosing the type of n scale track plan that suite your layout best. It’s always wise to view several track plans for n scale and take a bit of creativity from each n scale layout you see. The plans below are a helpful starting point for you to start planning your n scale layout. This n scale track plan is called the EZ and Kwik and was published by Kalmbach Publishing. Some key features to remember when viewing this layout is that all curves are 11-inch radius and an interchange track is added at the upper right. There are also additional features added such as a small engine service building and the track takes a different course along the front of the layout. From a scenic point of view, it’s highly suggested that the yard area of this n scale track plan be raised above the rest of the track plan. It’s easy to remove layout if it needs to be transported and used at other locations. The benchwork for this plan was of a box frame made of 1 x 4 pine and covered with 3/8 plywood. The plywood of this bench is covered by 2×4 ceiling tiles that were painted light brown before laying the roadbed of the layout. When observing the horseshoe n scale track plan, you’ll notice the top part is 12 feet long and the left side that goes all the way to the bottom of the layout before the right starts is 10 feet. 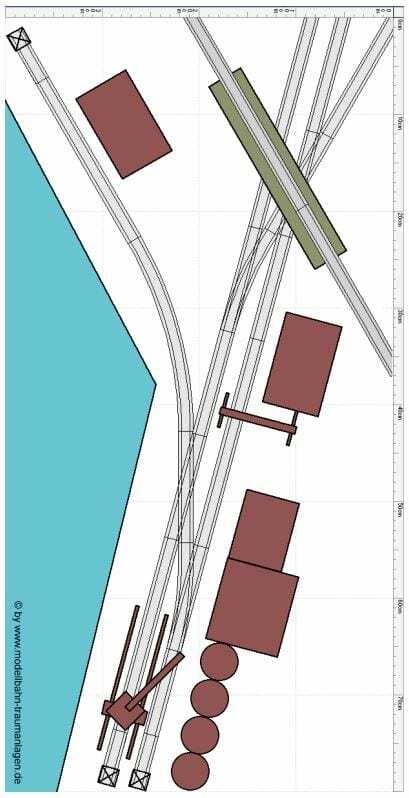 The best way to gain a quick understanding of this track plan made for n scale is to compare the track plan to the bench work and you’ll quickly get an idea of how everything fits together cohesively. Wiring this n scale track plan shape can be a little daunting but just remember that each section of track between track switches is connected to the DCC controller. Even a small model train layout needs to exist! The size of this layout is only 2.62 feet x 1.31 feet and the embankment is at an angle of 135 degrees. A big issue with n scale shelf layouts is the minimum curve radius that’s used. It’s suggested that at minimum an 11’’ radius is used. There is a possibility of using even smaller curves, but the overhang is noticeable. You can use a variety of things for a shelf layout most model train enthusiasts prefer foam insulation and paper building placement. Quick tip to remember is to add a bumper to keep the cars from falling off the shelf. If you don’t want the n scale shelf layout to hangover by a few inches, make sure all your measurements are correct before constructing and use some gaffer tape to temporarily hold the track in place if you must do some cutting after the layout is already built. N Scale Shelf Layout Video that is 13 feet long and is only missing the backdrop scenery. When building your first model train layout, choosing the right model train layout plan is vital to reduce hours of frustration. It’s important to take into consideration the limited space you have available plus consider the number of supplies on the market for the scale of your choosing. Finally, remember that “the smaller the scale the easier to break” but the more detail it will contain such as n scale.